Drain the salmon and remove bones and skins. Make a sauce of mayonnaise, parsley, tomato paste, whisky and paprika powder. Fold the sauce into the salmon . 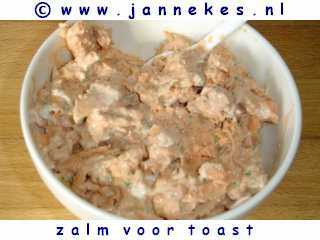 Spoon the salmon mix in a bowl and serve with (fish shaped) crackers.